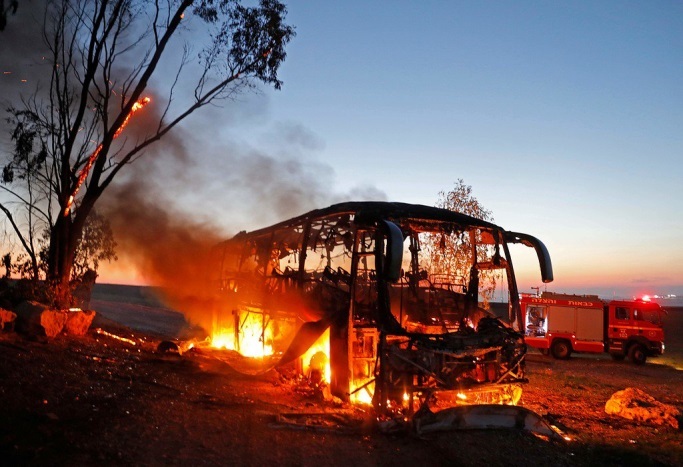 In Photo: A bus that was hit by a Hamas Kornet anti missile fired from the Gaza Strip. 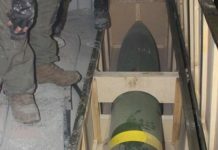 During an IDF special forces operation in the southern Gaza Strip on November 11, 2018, an exchange of fire developed between the force and Hamas operatives. An IDF lieutenant colonel was killed and another officer was wounded. Seven terrorist operatives were killed, six of them from Hamas’ military wing. Hamas’ response came in two stages. During the relatively limited first stage, 17 rockets and mortar shells were fired at the communities near the Gaza Strip (November 11, 2018). 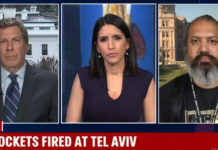 During the second stage, which began the following day (November 12, 2018), Hamas initiated a massive rocket attack, unprecedented in scope, on Israeli communities and cities in the western Negev. Note: On the afternoon of November 13, 2018, after about 24 hours of exchanges of fire, Israel and Hamas agreed on a ceasefire. Since then, southern Israel has been quiet. Hamas’ opening shot was a Kornet anti-tank missile attack on a bus carrying IDF soldiers, two of whom were wounded, one seriously. 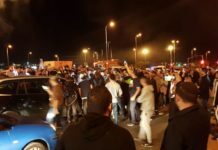 At the same time a massive barrage of rockets and mortar shells targeted the communities near the Gaza Strip, which was later extended to the southern cities of Ashqelon and Netivot. As of noon on November 13, 2018, more than 400 rockets and mortar shells had been fired, about 100 of them intercepted by the Iron Dome aerial defense system. 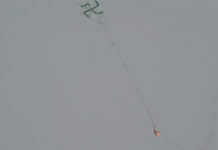 (Note: It was later reported that a total of about 460 rockets and mortar shells had been fired.) One person was killed and about 100 wounded, most of them incurring minor wounds. Heavy damage was done to several civilian buildings by direct rocket hits. 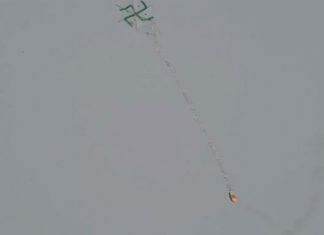 In response to the rocket attack the IDF attacked about 150 Hamas and Palestinian Islamic Jihad (PIJ) terrorist targets. The IDF changed its usual mode of response and in addition to area targets it attacked multi-story buildings in the Gaza Strip that were important to Hamas. They included the building of the al-Aqsa TV station, Hamas’ most important media outlet, which broadcasts incitement to terrorism; the building used by Hamas’ military wing and its intelligence; the al-Rahma building, used by Hamas’ military intelligence; and the al-Amal hotel, where Hamas’ internal security force was located. In ITIC assessment, the current rocket attack is not an isolated event, which can be explained as a response to a covert Israeli operation which got into trouble. 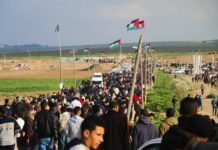 Rather, it is an integral result of the situation Hamas created on the ground in the wake of the “return marches” (which began on March 30, 2018). Hamas’ new policy is characterized by controlled violence against Israel. Since the end of May 2018, in addition to the marches, there has also been rocket fire of varying intensity, in most cases as a response to the harm done to rioters along the security fence and to those who carry out arson terrorism attacks. So far there have been four main rounds of escalation, the most recent of which has been the most serious (a total of about 1,070 rockets fired so far). 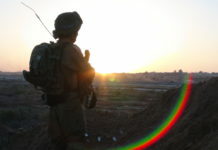 The rounds of rocket fire have been initiated by Hamas (and on occasion the PIJ), which decides when they begin and when they end(Hamas has declared that it wants to determine the end of the current round of escalation as well, threatening to extend the range of the rocket fire). In ITIC assessment, the current situation on the ground requires a strengthening of Israel’s power of deterrence to demonstrate to Hamas that it is not worth its while to pursue its new policy, and that it would be preferable to return to the status quo ante of March 29, 2018. When that happens the understandings reached after Operation Protective Edge could be used as an acceptable basis for an arrangement (that is, a complete and total cessation of the violence, including the “return marches,” in return for easing the “siege” on the Gaza Strip and the provision of massive economic support).